"My search for the perfect green tea is over!" Discover Joy was created to enhance mood and lift spirits with ashwagandha, lemongrass and oatstraw in a blend of green and oolong tea, bright lemon, and sweet vanilla. Ingredients: Organic Green Rooibos, Organic Green Tea,Organic Oolong Tea, Organic Lemongrass, Organic Ginger, Organic Lemon Myrtle, Organic Lemon Verbena, Organic Ashwagandha, Organic Oatstraw, Natural Flavors. Purposefully crafted for your emotional well-being. Restorative ashwagandha, uplifting lemongrass and nourishing oatstraw were used in this blend to boost morale and strengthen the body against stress. Ashwagandha, a restorative adaptogen herb from India, is an effective remedy for sadness and emotional fatigue. Lemongrass helps battle depression and relieve tension as a sedative for the central nervous system. Oatstraw is a powerful superfood high in minerals known to nourish and rejuvenates the nerves taxed from emotional disturbances and alleviate feelings of stress. 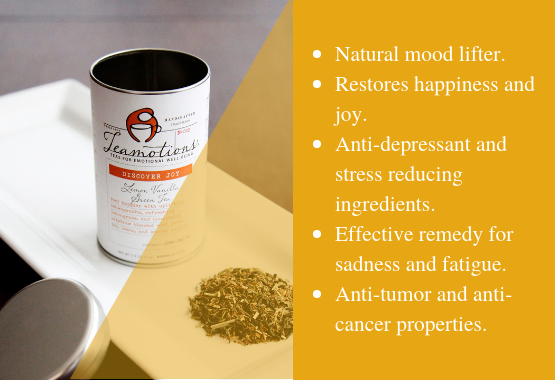 Used together in this blend, Discover Joy helps you let life back in and find good in all circumstances. THE PERFECT CUP OF TEA IS THE ONE YOU ENJOY! Your tea ritual should be your own and something you look forward to every day. Use the guidelines below to make the best cup of Discover Joy but don't be afraid to add your special touch! The Perfect Cup: Pour 8oz of 180 degree filtered water over 1 rounded teaspoon of loose tea and steep for 3 minutes. Take in the delightful aroma while you wait., then strain and enjoy. Resteep for a delicious second cup. Our Little Tip: As you sip, find a quiet place and make a list of ten things you are thankful for and discover joy in them. Carry the list with you for inspiration. Blended with scientifically supported adaptogen herbs and botanicals, each blend helps boost immunity, improve the body's response to stress, and restore well-being in every way. Used daily our teas will make a positive difference in how you feel. Try it today, and see what Discover Joy can do for you. What are people saying about Discover Joy?